I know it's been a while since my last post, but I just didn't have the heart to update. We suffered two great losses, and I just couldn't bring myself to write about it. The most recent loss was of my beautiful girl, Abby. I won't go into details, but at 12 1/2 years old, she just couldn't stand or walk. Those of you reading my blog last October know that she wasn't doing well, and we almost lost her then. But she rallied, and the same thing happened the week of Thanksgiving. This time, nothing helped her, she started to refuse to eat and the medications, acupuncture and laser therapy stopped working. So we had to let our sweet, perfect girl go. I knew at her age we could lose her soon, but I still wasn't ready. So I'm sorry for not updating, but I'm sure those who have lost their best friend will understand our heartbreak. I think my proudest moment of 2018 was when I continued our new "Versatile Collies" series. I'm very excited to showcase this amazing breed, and grateful to our friends who wrote these posts. My biggest challenge, which has been a challenge throughout all the years we have been blogging, is carving out time each week to create new posts. I have been working 60 hour work weeks for years, and competing at dog shows with my collies on weekends, so free time is hard to come by. I think one of my favorites was the post that I wrote about one our collies from our 2016 litter, Doing What He Loves. It shows how collies are more than capable of performing the tasks they were originally bred for, and how much they love it! I shared an older post, that has always been popular, and that was the most viewed post in 2018. I think people are naturally curious about all the different coat colors the collies come in, so when they search online, my post pops up. 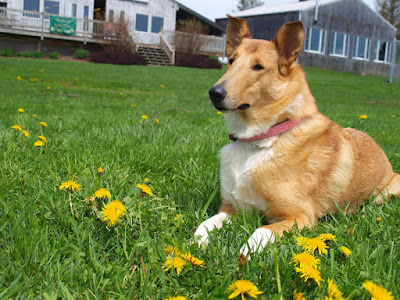 A Coat Of a Different Color But my next popular post would have to be Herding With Your collie, which was written by Michael Vorkapich, of the Agile Dog Blog. 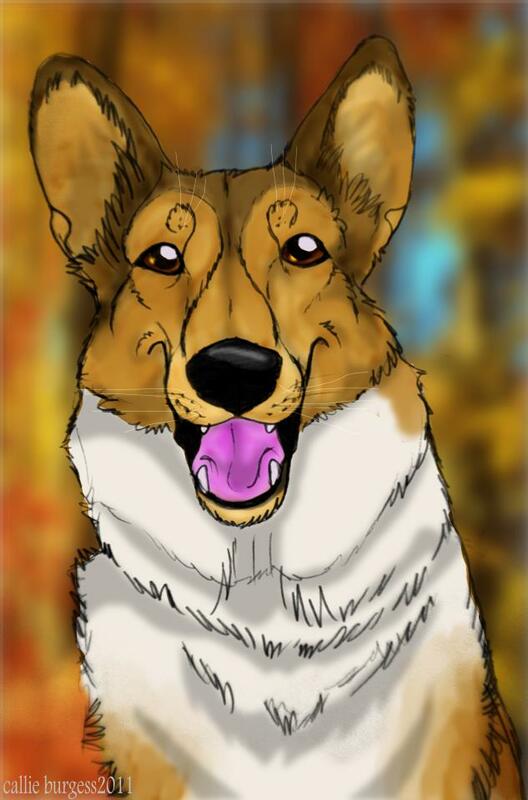 I started the Versatile Collie series in June of 2017, and then restarted it in 2018. I really love this series, and I am in the process of choosing the next post. I do not promote my blog enough, but I do utilize Twitter and Instagram, and I'm starting to use Pinterest as well. 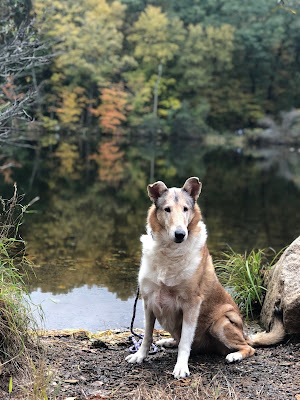 I want to go back to making my posts a little more personal, so our readers get to know our collies better and learn more about the breed. I'm looking for more guest bloggers, and creating a list of interesting topics to share. Plus, we hope to have some very exciting news to share in about a week or so! I would love suggestions for topics our readers would like covered. Thanks to our new friends at Treat Simple, we have another new dog treat to review! This company shares my belief that dog food and treats should be only made with quality ingredients. When I read the product labels for some of the popular dog treats I have to cringe at the ingredient lists. Treat Simple believes that dogs are family, and they deserve high quality dog treats made with human grade ingredients, and all their products are made right in the USA! When I look at my collies' sweet faces, I want to spoil them with treats they will love, while keeping them healthy with nutritious snacks. Which is why I get so happy when I read the ingredient list for Treat Simple's Peanut Butter and Banana treats. With just 5 simple ingredients, I don't have to worry about what my collies are eating. I also liked how small these treats are, they are perfect for small dogs, and for larger dogs who are trying to stay fit! And their small size makes them an ideal reward for training. So if you are looking for a healthy dog treat, with human grade, limited ingredients, then we highly recommend checking out Treat Simple. You can order the Peanut Butter & Banana treats by clicking right here. My dogs make my life better. They give me love and happiness, and I can't imagine not sharing my life with them. So I thought I would share my top 10 reasons why dogs make my life better. 1) Dogs can lift your spirits, even when you are feeling depressed. 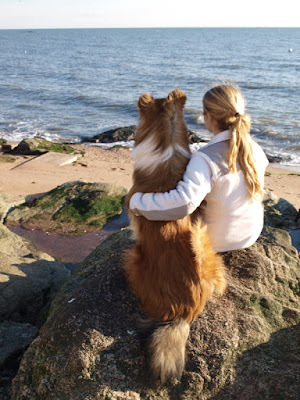 Studies have been done that show spending time with your dog increases your brain’s levels of dopamine and serotonin. Dopamine, Serotonin, Oxytocin, and Endorphins are the quartet responsible for your happiness. Many situations can trigger these neurotransmitters, but spending time with your dog is one of the easiest ways to increase your levels! 2) You never have to be alone when you have a dog, ever. My dogs follow me everywhere, even into the bathroom. And on the rare occasions that I leave a room without them noticing, it's not long before they are right behind me. Dogs are amazing companions, and a great way to keep people from feeling lonely. 3) When you share your life with a dog, you know you are missed every time you leave. Even if you are gone for 10 minutes, your dog is always happy to see you when you return. Are there any humans in your life that miss you that much? 4) On cold, Winter nights, dogs make excellent bed warmers! 5) Having a dog can help reduce your risk of cardiovascular disease. There are studies that show petting your dog will help to lower blood pressure, which lowers your risk for a myriad of different cardiac illnesses. 6) You never need to sweep up the food or crumbs you drop. Your dog will always be there for clean up duty! 7) Your dog will never, ever look down on you for wearing old, comfortable sweats or pajamas. They just want to be by your side, no matter how you look or what you wear! They will even join you when you spend a rainy day binge watching Netflix! 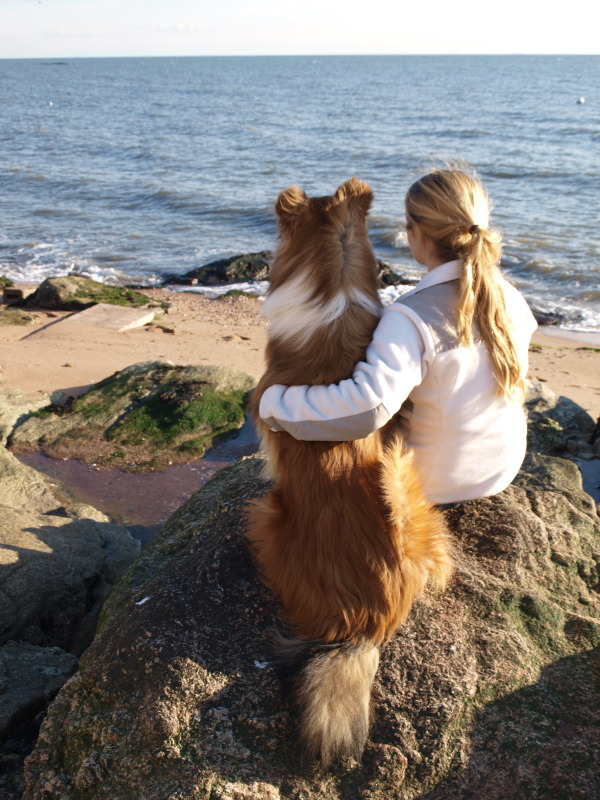 8) Having a dog encourages us to lead a healthier lifestyle, by getting out and taking them for walks and hikes. They also help you socialize and explore the world around you. 9) They teach us to enjoy every moment, and to find pleasure in even the simplest of things. 10) Dogs are the best because they love you unconditionally. Even when you make a mistake, they love you anyway without judgement or resentment. What would be in your top 10 list of reasons your dog makes your life better? It's been a while since we last posted, and my only excuse is that I was sick with the flu for the holidays. I spent most of my time snuggling with my collies and sleeping! I am finally recovered, but I missed out on all the holiday fun! We hope all our friends had a happy and joyous holiday season. We wanted to continue telling you about the products made by our new friends at Treat Simple.com. At TreatSimple "they believe in simple, honest ingredients that are proudly baked in the USA with the finest human grade ingredients. Their Mission is to provide a quality, naturally tasty treat your dog will love." I think that statement says it all! I can't tell you how excited I was to discover a company that shared my desire to feed only healthy, delicious treats to our dogs! The next one of Treat Simple's dog treats that we wanted to talk about are their Waggin Wallflowers dog treats. Ingredients: peanut butter, oat flour, glycerin, rolled oats, molasses, tapioca, flax seed, coconut oil, peanuts, apples, mixed tocopherols (a source of vitamin E). If you want to order these, or any of the other Treat Simple products, you can find them by clicking here! Ryder says, "Trust me, your pup will love these treats! I just wish my sister hadn't finished off the bag!" Did anyone notice a new face in this post? 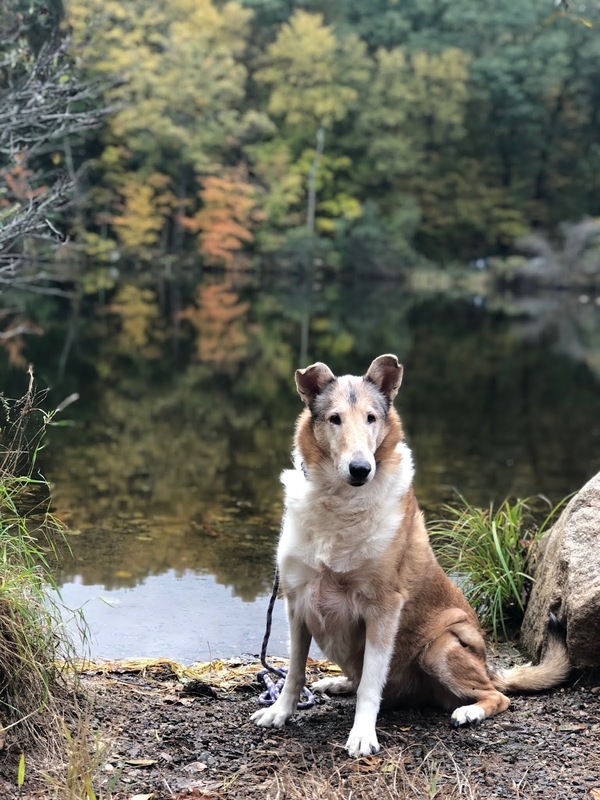 We didn't get a new rough collie, but you may have seen him in previous posts. The collie on the right is Finn, our Sophie and Maizie's brother. He is now a Therapy Dog too, and his mom brings him on Therapy Dog visits with us, so you will see more of this pretty boy in future posts. You can find our previous Treat Simple review by clicking here! Sophie and Winter also pawticipated in the gift exchange, and they were matched with Millie and Walter of the Bird Brains and Dog Tales blog. This was another blog we had not read before, and I was so happy to meet them! 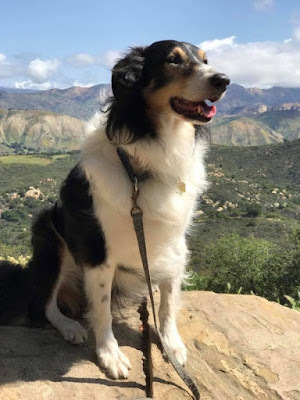 Millie and Walter are so pawsome, and they do a lot of reviews just like the collies. Their mom makes embroidered scarves and toys, and even has her own Etsy shop. 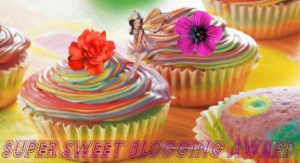 If you haven't met them, please stop by their blog and say hello! They were being so patient with me, waiting for me to take pictures before they opened their presents! Have I mentioned that I am a Game of Thrones fan? Both Winter and Sophie each got a new scarf, each perfect for their personalities. Winter is a sweet, funny girl...but she thinks she is also very brave. And Sophie is gentle and sensitive, and one of our newest Therapy Dogs. And they also got a personalized stuffed bones! Winter and Sophie love their presents, we can't thank you enough! We hope Millie and Walter and all their family members had a wonderful holiday! If anyone wants to check out Millie and Walter's (and their Mom's) Etsy shop, you can find it at Cindy's Thread Craft! We hope everyone had a very Merry Christmas, and a Happy New Year! Merry Christmas! Hope everyone had a wonderful Christmas, I have been really sick for the past few days, but we still managed to have a fun holiday. My family gave me two new cameras, to watch the collies when I am not at home. One is a Furbo, which will allow me to talk to them and give them treats when I am at work. We also participated in the the Blogville gift exchange, and we were paired with two other bloggers, as we have a pack of collies and none of the other bloggers with multiple dogs signed up this year. But it turned out to be a great thing, as we met two new (to us) bloggers, and we love making new friends! So our first box of presents was sent to us from the Kinley Westie Blog! They had Ryder, Kori and Scarlett, and we had their three beautiful Westies for the exchange. If you haven't read this blog, you should definitely stop by and say hello. The blog is about three adorable Westies - Kinley, Brinley and Finley, and they are very fashion conscious and always wearing new outfits. The collies were very curious about the gifts, and Abby joined them. Since Abby doesn't really like toys, we didn't have her pawticipate in the gift exchange, so she let her three kids open the presents. She just likes to be included, and whatever Abby wants, Abby gets, as befitting a sweet, senior. First, they had to inspect the contents of the box! And then they opened their gifts. They loved the new toys, and really loved the cookies. As cookies are Abby's favorite, she had to try a few too! There was even a little bag of candy in their for me! And in the bag was an adorable pair of dog socks, I love them! Thank you Kinley, Brinley and Finley, we loved the thoughtful gifts and loved getting to know you guys even more! Fabulous Felines love Tiny Tiger Cat Treats! This month the kitties also tried Tiny Tiger cat treats from Chewy.com. I was tempted to wait until Christmas to let them try these, but then our readers wouldn't have time to order some for their kitties! Tiny Tiger treats are sold exclusively by Chewy.com, you won't them anywhere else. And the first thing I want to mention, is that I love the name! Pumpkin is definitely my "Tiny Tiger," don't let her tiny size fool you. And Goblin, though twice her size, and more of a gentle giant, wanted in on these treats as well. But then, this boy is ALWAYS hungry! So he was especially excited to see kitty treats, as he hates waiting for mealtimes for a kitty snack. I wanted to also mention that these treats are very affordable, and come in a nice size container. So they should last a good while. These crunchy little treats come in cute shapes - stars and moons! While the shape of the treat might not matter much to them, I thought they were adorable. These treats were so appetizing, I actually got my very first picture of Pumpkin and goblin together! (It's amazing what a kitty treat will accomplish!) They were waiting so patiently for me to finish taking pictures, I think these Tiny Tiger treats might be the key to teaching them some kitty tricks! So both Pumpkin and Goblin enjoyed these cat treats, and while I am trying to keep them at a healthy weight, these are small enough that I don't have to worry. My two purr machines were so thankful for these treats, they just love our friends at Chewy! We all definitely recommend them, so head over to Chewy.com to order some for your fabulous felines! We were sent these treats for free, in exchange for our honest review.